Over the course of three days, June 5, 6, and 7 in 1970, simply sitting on a white bench in a Hamburg park, Thomas Bernhard delivered a powerful monologue forThree Days (Drei Tage), filmmaker Ferry Radax’s commanding film portrait of the great Austrian writer. Radax interwove the monologue with a variety of metaphorically resonant visual techniquesblacking out the screen to total darkness, suggestive of the closing of the observing eye; cuts to scenes of cameramen, lighting and recording equipment; extreme camera distance and extreme closeup. Bernhard had not yet written his autobiographical workGathering Evidence, published originally in five separate volumes between 1975 and 1982, and his childhood remembrances were a revelation. This publication of Bernhard’s monologue and stills from Radax’s artful film allows this unique portrait of Bernhard to be savored in book form. 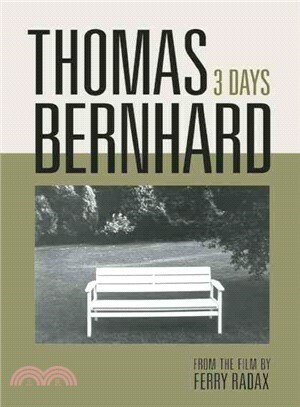 Thomas Bernhard (19311989) is internationally acclaimed as a writer in the pantheon of world literature classics. His widely translated works include poetry, drama, novels, and an extensive memoir. He won many of the topmost prestigious literary prizes of Europe, including the Austrian State Prize, and is regarded as Austria's greatest postWorld War II writer. His works includeFrost, The Loser, Concrete, The Lime Works, and his memoir,Gathering Evidence. Ferry Radax is an Austrian filmmaker known especially for short experimental films, documentaries, and portrayals of poets and artists, including Thomas Bernhard, Konrad Bayer, and Friedensreich Hundertwasser. He lives in Hollenburg, Lower Austria. Georg Vogt is a lecturer at the Institute for Theater, Film, and Media Studies at the University of Vienna. He lives in Vienna, Austria.